Good news for all our Mahatmas. ‘Dada Bhagwan App', is now ready on apple store for download. Now mahatmas may not wait any longer as all the treasures of Param Pujya Dadashri’s Akram Vignan can now be accessed on ‘Dada Bhagwan App', on your iphone and ipad. 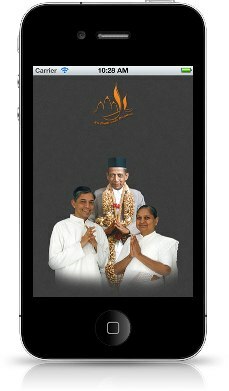 With a simple look, instant and easy access, mahatmas can now keep in touch with the latest satsang media of Param Pujya Dadashri, Pujya Niruma and Pujya Deepakbhai in the form of books, photos, audios, videos directly onto your mobile over the internet. So what are you waiting for! Download Dada Bhagwan App right away and ‘Stay connected with the God within you’. With the earnest prayers to Dada Bhagwan, may Mahatmas progress in their journey to Ultimate Liberation.